I could not cut the glass plate clean, but I could arrange it with this item. This review is about item#05587592. We are satisfied that we can also purchase with one piece at reasonable price. This review is about item#5587583. Although it is used for fine baling after grinding and polishing of the curved surface, it has a so-so effect. This review is about item#05587583. I think that it is used for finish cutting of tile joints, but it is still unused. I do not get a feeling. I used to cut out the convex mirror to just the right size. It was difficult because glass was put on it unless it was scraped carefully, but it worked well. The price is also cheap and it seems to last a long time as much as cutting thin glass. I bought rough things of the same number at the same time but it was not suitable for sharpening thin glass. I am using it to make the quartz shape. It is useful for determining the shape. I made pottery but used to scrape off the soil and to fix the glaze dripping. It reduces crack cracking time and does not feel stress. This review is about item#05587601. I purchased a transparent glass plate (t3) to shave it about 1 mm. (Shaved length is about 80 mm) (It is difficult to cut 1 mm with a glass cutter.) Although there was no major collapse, it could not be cleaned beautifully. It seems that the side part is wavy, the cutting trace is biased to a part, probably because of that. 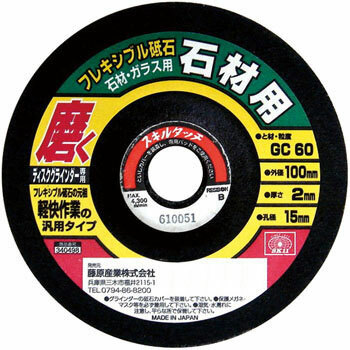 If you want to cut the glass cleanly, it seems that a grinding wheel dedicated to glass is good. Pad for Grinding Wheel"High Wrap"